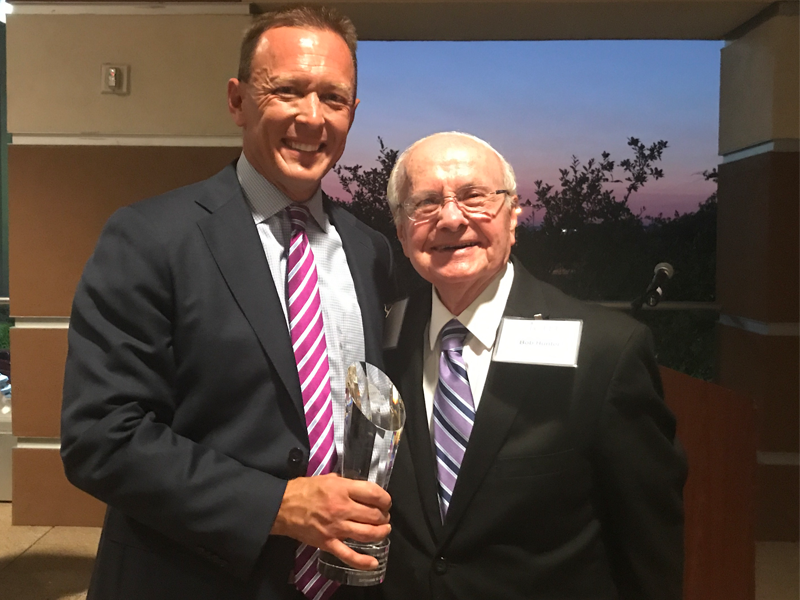 The Independent Colleges and Universities of Texas (ICUT) has renamed its highest award in honor of Dr. Robert D. “Bob” Hunter, Abilene Christian University’s vice president emeritus. Since 1990, ICUT – of which Abilene Christian University and all other private colleges and universities in Texas are members – has on occasion conferred the Founders Award. The award has always represented the highest honor the association can confer, with the name recalling the small group of visionary college presidents that filed Articles of Incorporation founding ICUT in 1965. This group’s vision for ICUT saw it becoming the voice of Texas’ fully accredited private colleges and universities, especially in the public arena. Hunter, for whom the ACU Hunter Welcome Center is named, is a past recipient and ICUT board member. He served on the Texas House of Representatives from 1986-2007. The mission of Independent Colleges and Universities of Texas Inc. (ICUT) is to support Texas independent nonprofit colleges and universities by strengthening member institutions through advocacy, policy research and collaboration. A non-profit association, ICUT is the voice for Texas’ fully accredited private colleges and universities. For more than 50 years, it has fulfilled its mission of helping policymakers recognize the importance and value of the independent sector of higher education by successfully articulating the sector’s needs and aspirations. Included in the list of prestigious recipients are Lt. Gov. William P. Hobby Jr. (1990); Dr. Norman Hackerman (1991); Ray L. Hunt (1994); The Honorable Wilhelmina Delco (1995); Dr. John D. Mosley (1996); The Honorable John T. Montford and Commissioner Kenneth Ashworth (1997); State Comptroller John Sharp and Lt. Gov. Bob Bullock (1999); The Honorable Bill Ratliff (2004); Robert T. Priddy and Robert J. Wright (2005); Will D. Davis (2006); Dr. Robert D. Hunter (2007) as well as all six of the former legislators who sponsored the TEG bill in 1969 and 1971 (1998). Bob Hunter and I were freshmen at ACU in 1948. The first day of school we met with others for a tennis class in front of the gym. The student instructor did not show up, so most of us just talked to some one person near us. But then Bob came bouncing up, and proceeded to meet everyone in the class. Why would this guy do that, I thought. He could not possibly remember any of their names. But I didn’t know Bob’s ability to do unusual things. At our next meeting he was calling almost everyone by name.